Weekly Photo Challenge: Mountain – Happily After Retirement! A view of the mountains is wonderful but nothing beats being in the mountains and enjoying the open sky, mountain lakes, plethora of wild flowers and the total Joy of it all! I love the Colorado Rockies. It has been too many years since I’ve been there. Lovely Lovely Lovely! What a beautiful, beautiful shot! Agree with Rebekah about award deserved. wow. What a beautiful mountain, Marge! 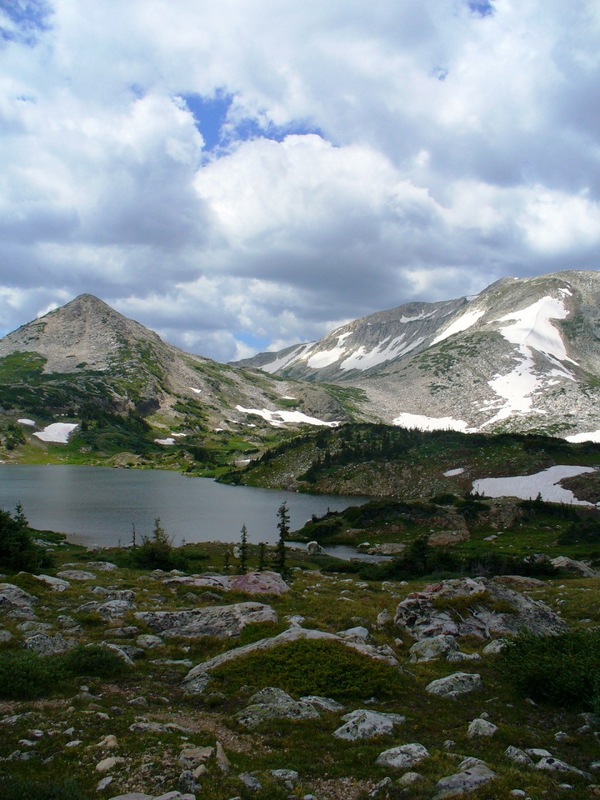 Medicine Bow is located in WY and is part of the Rocky Mountain range that people forget about. No tourists, no vehicles and lots of room to hike! Thanks! This was an amazing hike with the right amount of clouds for shade and great photos! We have so much beauty around us, don’t we? We are blessed time and again! I love that picture. I can feel the fresh air and the sun on my face. I love hiking in the mountains. Me too. I feel like it’s me and the mountain and the rest of the world has to wait in line to get in my head! The smells, scenery, sky and serenity make it all such a sweet experience! Thanks — the hike was taxing but the view made up for it all! Thanks — I especially love when I am in the mountains taking the photo! Our dream is to one day live in Colorado..and this photo is one of the reasons why! Beautiful! Just noticed the photo said WY. Gotta love the Rockies! Thanks for the correction. We’ve camped in WY, too. It is all lovely. WY is lovely and a huge secret! So much beauty in Medicine Bow and the various hot springs and the Grand Tetons! A huge secret that is a surprise when people realize it’s just up the highway! I have a suspicion that people who move to Colorado breathe in with awe every single day due to the view, weather, open sky and mountain range. Where I lived in Upstate NY, there were 60 days of sun per year!!!! In Colorado we have 300! And back east there are so many trees, you can’t see the sky! And when you can see the sky, you have to peer through the telephone and electric wires. I have an ‘outsiders’ appreciation for this wonderful place! This beautiful photo makes me want to run away and build a small log cabin in one of the folds by the lake . . . I know what you mean! Just be sure to add a spare room for all of us that plan to visit! I know what you mean! When I look at it I wonder why I’m not there, again, at this very moment! So serene and so wonderful because it was quite a hike to get there! There is so much beauty here and I think it’s the ‘outsiders’ like us who adore each and every moment of it!